Justin Ndikumana completed a double scoop for Sofapaka, clinching the Sports Journalists Association of Kenya (SJAK) player of the month award for March with his tactician John Baraza having won the coach’s award last week. Ndikumana became only the second goalkeeper to win the monthly award since its inception after Gabriel Andika who won the May 2015 award while at Western Stima. He beat Ulinzi Stars’ Enosh Ochieng and KCB’s Bethwel Warambo who managed 21 points each against the Burundian’s 27. “Such awards boost my confidence and the team at large. I want to thank the entire squad, not just the defense that helped me keep the clean sheets. I feel like I can face any opponent and stand tall in goal and prevent them from scoring,” said Ndikumana. 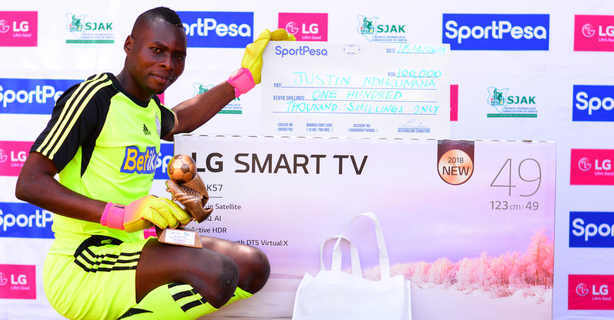 With the award, the Burundian went home with a 49-inch Smart TV from sponsors LG, a personalized trophy and Sh100,000 while his team also got an equal amount. Sofapaka also won an award in February, striker Umaru Kasumba being named player of the month.